In other words, while people create a culture just as the spider creates a web, people cannot live without culture any more than a spider can survive without its web. And just as different species of spider build webs with different patterns, so different groups of people create different cultures. What then is culture? It is the lens through which groups of people (members of a society or an entire society) interpret the things they observe and experience. This lens varies from one culture to another. One culture may interpret an exploding volcano as the result of shifting tectonic plates in the earth's crust; another may interpret it as the anger of some force or god at the misbehavior of a people. Ger exterior, early 20th century, courtesy of the National Museum of Mongolian History. Our culture lets us know what is meaningful to us - what is important or significant, what is good and what is considered bad. While culture is an abstract term, we can "see" it - or its path - in the artifacts, speech or writings, and behavior of a people. Given this definition of culture, we can say that political culture is a people's preference for one way of making decisions about how a nation should be governed. It is a people's views on who should make policy for the group and how the policy-makers should go about their task. Ger exterior, 2000, Hentii Aimag. Alexis de Tocqueville, the Frenchman who visited our country when we were a young democracy, characterized American political culture as guided by love of equality and individualism, civil society, a belief in the sovereignty of the people (through majority rule), and distrust of government. * Mongolian political culture may be seen in Section 4. 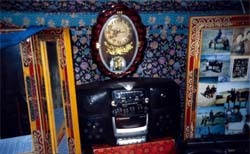 Contemporary ger altar of a young couple, Tuv Aimag, 2001. 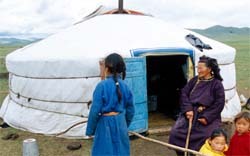 The influence of government on material culture is clearly visible when studying the changes in the artifacts of Mongolian daily life over the course of the 20th century. 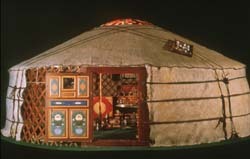 The ger (the nomadic portable home) changed little from Manchu times preceding the 20th century to the democratic period that closed the century. 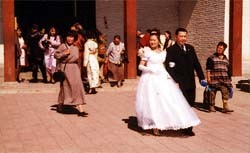 Modern Mongolian dress combines traditional Mongolian and contemporary Western elements: A wedding in Ulaanbaatar, 2000.